Where Did All the Jacaranda Trees in Los Angeles Come From? Home Outdoors Gardens and Green Spaces The History of Those Beautiful Jacaranda Trees in Bloom Around L.A. The History of Those Beautiful Jacaranda Trees in Bloom Around L.A. When you look up at a vibrant purple jacaranda tree—or a bush of bougainvillea, sprout of birds of paradise, or fragrant patch of jasmine, for that matter—you can thank Kate Sessions, a pioneering female horticulturalist who helped make over the natural environment of Southern California. Sessions was born in Barbary Coast-era San Francisco, amongst the gold speculators and vigilantes. Early in her childhood her family moved near Lake Merritt, which, in 1870, would be designated as the country’s first official wildlife refuge. She went on to be among the small cohort of women to attend U.C. Berkeley in the initial years after the Board of Regents opened admission to female students, and, in 1881, received her degree in natural science. After graduation, Sessions went on to enroll in business school in San Francisco, but was lured south by an offer of a job as a school teacher in San Diego. Plants had always been her passion, but once she arrived in Southern California, that passion exploded. Her job as a teacher lasted only one school year, but she quickly purchased a nursery and flower shop and established flower cultivating fields in Coronado, Pacific Beach, and Mission Hills. She was fascinated with plants growing in exotic parts of the world, and was experimenting with bringing seeds and plants from Europe, Mexico, and South America, as well as cultivating native California plants. She became the most sought-after landscape designer for fashionable homeowners and residential developers in the fast-growing city. In 1892, she made the deal that would change California’s landscape forever. Sessions leased 32 acres of land owned by the city of San Diego which was then known as City Park. The field was barren, pest-ridden, and lacked any formal landscaping. Sessions agreed to amend the situation by planting 100 new trees per year in the park and 300 trees per year elsewhere on public lands around the city. In exchange, she could use the property as a kind of laboratory and growing field. That property was filled with cypress, eucalyptus, palms, and jacaranda—and, along the way, was re-dubbed Balboa Park. A bronze statue of Sessions was placed in the park in 1998, and it’s still the only statue of a historical woman anywhere in San Diego. In 2006 the Women’s Museum of California inducted her into their Women’s Hall of Fame and produced a short video about her contributions to the city. Word of San Diego’s transformation into a colorful and lush environment quickly spread up the coast, as did the popularity of the exotic plants that Sessions demonstrated could flourish here. Jacarandas, with their beautiful blossoms in a distinctive purple color, were an easy sell, and in the 1920s and ’30s they were planted extensively in Los Angeles and Santa Barbara. 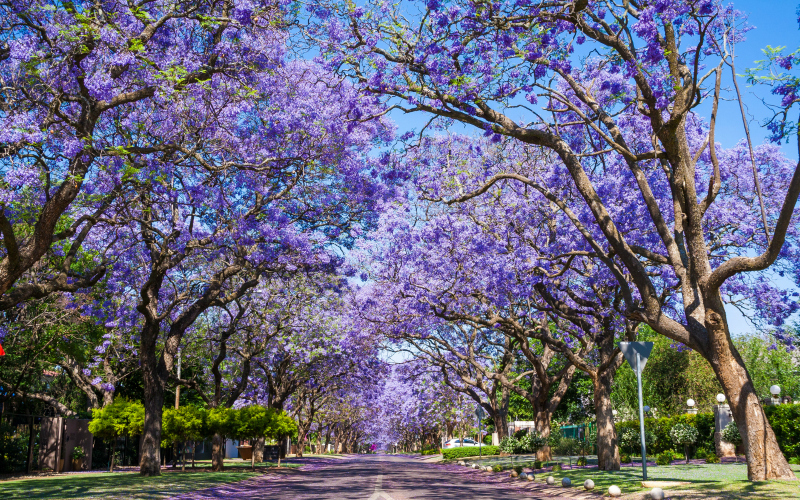 Sessions died in 1940, but her legacy continued as Los Angeles grew and jacarandas became one of the most recognizable trees in the region. Most of the jacarandas seen in L.A. are Jacaranda mimosifolia, one of the 49 different types of flowering jacaranda trees. One specimen in Santa Ana is on the official registry of Big Trees, measuring 58 feet high, 98 inches around the trunk, and more than 73 feet across the spread of the branches. Are There Efforts to Keep L.A.’s Old Trees From Being Cut Down?